The advent day of Gadadhara Pandita is on Amavasya, on the night of the dark moon. Mahaprabhu came in the full moon, Purnima, and He drew the entirety of internal wealth from Gadadhara Pandita. Mahaprabhu made him quite empty. He sent Gadadhara Pandita on a black night in the hot summer season. In Mahaprabhu's case, He descended on the night of the full moon during a very good season. Krsna descended in the middle of the lunar period. Radharani also appeared in the middle. When They combined as One, They appeared under the full moon. But Gadadhara Pandita appeared under the blackest night. Gadadhara Pandita appeared and disappeared during the summer season, under the new moon. Mahaprabhu took the fullest advantage from Gadadhara, and sent him to the most negative position. Gadadhara Pandita gave himself voluntarily to Him. His very heart was drawn by Mahaprabhu, bhava-kanti. And he, just like a shadow, gave the entirety of his wealth to Mahaprabhu. Gadadhara Pandita was a shadow, running after Him as if his heart had been stolen. This Person stole all his wealth, and he was fully dependent on Him. Like a shadow, he is moving after Him. Radharani has two corresponding moods: She is Radha in krsna-lila, and in gaura-lila, the mood of distribution, She is Gadadhara. In gaura-lila, Krsna Gauranga appears with the bhava-kanti of Radharani as Gadadhara, the man standing by His side like a niskincana, one who has lost everything. He is standing there just like a facsimile, only a carcass, only the form without the spirit. But Gadadhara has so much inner attraction for Mahaprabhu that it surpasses all of His other associates. In Gadadhara we find personified love for Gauranga. No such degree of love for Gauranga can be found anywhere else. Next in affection is Svarupa-damodara. Then come Rupa and Sanatana, in the madhurya-lila connection; then Nityananda, and Saci-Mata in the vatsalya connection. Advaita Prabhu and Srivasa Pandita also have love for Mahaprabhu, but their devotion is of another type. It is not so deep from the point of view of love, but a respectful attachment. Gadadhara Pandita tolerated injustice his whole life. All wealth was plundered from his heart. As with Radharani, everything is ransacked by Krsna to enhance His lila. And the real owner, he is treated as if he were bankrupt. Gadadhara is bankrupt in his own wealth; that is his position. He is wholly dedicated to Mahaprabhu. Gadadhara Pandita's position, the part he played, was something like that of Radharani: Her heart stolen by Krsna, the empty body still standing. Radha-bhava-dyuti-suvalitam naumi krsna-svarupam – he was fully engrossed in the conception of Sri Gauranga. Gauranga took everything from him, so he had no other alternative; he was fully absorbed, captured completely by Him. We find his activity throughout his whole life was like this. Of the other devotees, some were ordered to go to Vrndavana, and some were allowed to go there, but though Gadadhara Pandita wanted to visit Vrndavana with Mahaprabhu Himself, he was denied. When Jagadananda Pandita asked to go there, Mahaprabhu, with hesitation, granted him permission, “Yes, go there, but move always under the guidance of Rupa and Sanatana.” He also gave him some special instructions. But Gadadhara Pandita was not allowed to go there. He was the expansion of Srimati Radharani Herself, yet his peculiar position was such: the Queen of Vrndavana, but now transferred to Navadvipa. His position had become just the opposite; he could not enter Vrndavana! He prayed for permission, but Mahaprabhu did not give it. He said, "No, stay and live here." And he had to do so. Sri Gadadhara Pandita represents the Predominated Moiety of the Whole. The Whole consists of Predominating and Predominated Moieties, and he represents the predominated half. He is one half of the Absolute Truth. We may look to the outer aspect of Gadadhara; his bhava has been taken, emptied. Rukmini means daksina, not vama. The vama nature is a little aggressive, and fights with the lover. Daksina tolerates everything, whatever comes, only with a defensive attitude. That is daksina, that is the mood of Rukmini. So when Mahaprabhu plunders the spirit of Radharani, the rebellious vama nature, what remains is comparable to Rukmini – a passive seer, without any power to assert, only an onlooker. An onlooker – tolerating everything, a very pitiable condition that elicits kindness and sympathy from everyone. Just see what He is and what She is, and what is Her position now. See how Her lover has taken everything from Her, looted everything from Her, leaving Her as a beggar wandering in the street. Radharani, when ransacked to such a degree by Krsna, becomes Gadadhara, the pitiable figure. But Her wealth cannot abandon Her forever. She is the proprietor; the owner cannot be far off. After a long time, all must come to Her again, someday. And those who serve Her in Her day of distress will receive a great remuneration when She recalls Her property. Gadadhara is the asraya (shelter) and Gaura is the visaya (enjoyer). But visaya has taken the mood, the nature of asraya. That is Gaura, both shelter and enjoyer combined. When Krsna assumes the characteristics of Radhika, He is Gaura. The inaugurator of nama-sankirtana, that is Gaura-Narayana. He is visaya-avatara, the incarnation of enjoyment. Gauranga is Radha-Krsna combined; He is Krsna in the mood of Radhika. He has accepted the nature of Radhika. When He is searching after Himself, trying to taste what sort of ecstasy is in Himself, that self-searching Krsna is Gauranga. He is trying to understand Himself, what sort of ecstasy is within Him. Krsna in the mood of His devotee, that is Gauranga: introspection, self-seeking, searching for His own wealth. He is also distributing it to others. He is inquiring about Himself and distributing that personally to the public. That is Gauranga, showing how He should be served by serving Himself. He is demonstrating to the public how He should be served. And for that He took the mood of Radharani, to search after Himself. What is there? Why should others come to Him, what is He that so attracts them? And then He is giving Himself to others. Krsna is guru. When Krsna Himself is guru, then He is Gauranga – guru-rupa-hari guru-rupa-harim. Gadadhara Pandita is radha-bhava-dyuti-suvalitam. The entire wealth of Radharani's feelings, Her sentiments, mood, and even Her luster were taken by Krsna. Radharani voluntarily gave all these things. “I can't allow You to roll on the earth with Your body. I shall enfold You.” That emptiness we find in Gadadhara Pandita; he is running after Mahaprabhu as His shadow. But he is not poor. It is his wealth that has given Mahaprabhu such a dignified position. Some even think that He is superior to Krsna Himself, that magnanimous Gauranga, the public deliverer of Krsna. For our interest, on behalf of the fallen souls, Gaura has come to us for general relief work. We cannot but think that He is greater than Krsna. And Gadadhara Pandita's contribution is there in Him. In the high summer, in the darkest night, Gadadhara Pandita appeared. But that does not mean that we should underestimate him. What is his reality, his nature as Radharani, we have to inquire, understand, and realize. Gadadhara Pandita disappeared on Amavasya, during the dark moon. Bhaktivinoda Thakura also passed away under the dark moon. Prabhupada has written, gadadhara din dhari paiyaca gaurahari. Prabhupada noted something common to Bhaktivinoda Thakura and Gadadhara Pandita, that they disappeared on the same day. In this connection Bhaktivinoda Thakura received the grace of Sri Gauranga. Bhaktivinoda is a favorite of His; Prabhupada has revealed this. In another place he wrote that the eternal pastimes are always going on in Navadvipa-dhama. Sometimes they are underground, invisible to us, and sometimes on the surface. Nitya-lila always is invisible to us. Now, suddenly, these two personalities have come to the surface, Gadadhara Pandita and Svarupa-damodara. Both have come. 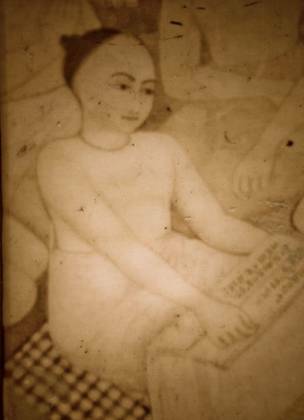 Svarupa-damodara came as Gaura-kisora and Gadadhara Pandita came as Bhaktivinoda Thakura. This is not to be given expression in any and every place. This is concealed truth, not to be expressed everywhere and anywhere. This is the fact: they are always here, continuing their own function, their participation in the lila of Gauranga. Sometimes it is underground, sometimes over-ground, but it is always difficult to recognize them. May Gadadhara Prabhu be my exclusive goal, the destination of my whole life. He is sent to engage in a particular duty on the shore of that infinite ocean. The infinite ocean is there and just on the shore he is sitting, and what is he doing? What is his duty? Aksepanvitam bandhavam – He’s giving consolation to his friend. And who is that friend? It is Mahaprabhu, who is madly searching for His own self. He is mad! Aksepanvitam – in a very distressed condition. He is greatly afflicted with separation from His own Self. Gadadhara is such a friend! He is giving some wine to give Him relief from that pain. And what is that wine? 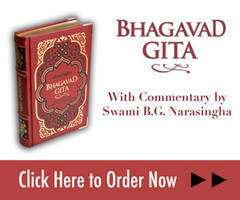 That is bhagavati-katha – the discourse of Srimad Bhagavatam of Krsna and Vrndavana. He is distributing, serving the wine of bhagavata-katha to his friend who is suffering from the extreme pain of the separation from His own self. Such is severe separation. Sva-viraha – He is searching in separation from His own self and it is so painful. He is afflicted and to remove His affliction, Gadadhara is serving some wine, and that wine is coming from the discourse of the Srimad Bhagavatam – the Vrndavana story. Sanjivayan bhati yah – he is enlivening His life giving that wine of krsna-katha. Srimad bhagavatam sada sva-nayanasru-payanaih. Asru means articles of worship, and what are the articles for the worship of the Bhagavatam? His own tears – he is worshipping the Bhagavatam with his own tears. Gosvami-pravaro gadadhara-vibhur-bhuyat – may I be blessed with the grace of Gadadhara Pandita, the master of the Bhagavatam from whom Mahaprabhu listens to the Bhagavatam. I invoke His mercy. Gadadhara Pandita…his identification was such.